This Creeper from the game minecraft was proudly designed by me. It is low intermediate so beginners may need a while to figure it out. The folding itself is simple but the assembling of the head is a little tricky. Those handy diagramms don’t make much sense on their own, but make the video easier to follow. 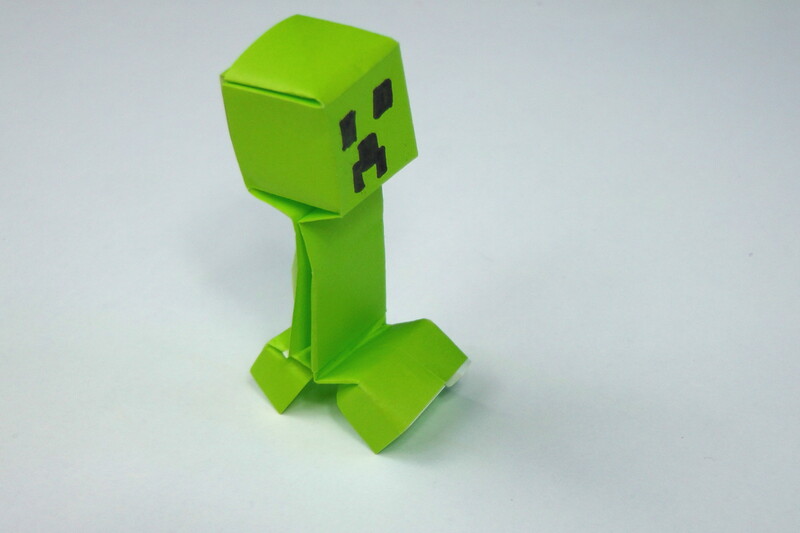 I recommend to use small and stiff paper for this Origami Creeper. For example 7,5cm times 7,5cm. If you have access to tant-paper, use it! but green printer-paper is great too. I’m a fan of minecraft myself. The block design of the game makes it easy to imagine it’s characters as origami. So I was pretty surprised that there wasn’t any minecraft origami creeper already. This is why I gave it a try. I wanted a model that also fan’s of the games could do. That is why I choose this simplistic approach. The more advanced folders will find many ways to add more details to the model (e.g. the feet can be folded to match the original more closely). But that would have made the model a lot more confusing for people that are new to origami. I’m pretty happy with the way I did the cube-head. For sure there are other models that use that mechanism too – but I figured it out myself :). Drawing the origami creeper’s face on the paper is a small trade-off for the simplicity of the design. Somehow I forgot about the model for while, I designed it over a year ago allready.